CIBA began in 1965 with a few dedicated people. Several rides were organized but the interest died down. In 1968 the interest was again generated and several rides were held mostly in parks around the Indianapolis area. This continued into 1970 where attendance at rides was anywhere between 18 to 70 riders. During this year the first century was held and much to everyone's surprise, ninety-nine riders registered. The CIBA we know today was officially organized in January 1971 with 245 members. Sixty persons attended the first meeting. Officers were selected, membership was taken, and a club emblem was designed. Catherine Dusing was elected the first president. 1971 was the first full year of organized rides and events. The main event was a 150-mile ride spread over a two-day weekend. This was a momentous task considering that 1971 was the beginning of the bike boom. Most people only rode in their neighborhoods, let alone 150 miles. In 1972 the membership increased to 458. Several rides were organized with special time trials being held at the Indianapolis Motor Speedway. In 1973 membership increased again to 646. The highlight of that year was a 500 mile ride to light the torch at the 1973 Indianapolis-Scarborough Peace Games held in Ontario, Canada. The membership climbed to 973 in 1973. However, attendance changed. Analysis showed that many members were from the ages of 8 to 14. Parents thought bicycling was for children and thus, thought children should be members. Consequently, leading a CIBA campaign explaining that bicycling is not child's play. Several task forces were implemented educating the public about ride safety. One task force created the Bicycle User Map, a map of Indianapolis indicating good roads for cycling. CIBA wrote the Ride Leader's Guidelines used by the League of American Wheelmen and hosted the League's Convention in 1984. CIBA also provided the majority of the brains and brawn for the 1982 National Sports Festival and the 1987 Pan Am Games cycling events. In addition, CIBA has supplied volunteers for RAAM (Race Across America) checkpoints and numerous other races that occur in the Indianapolis area. Because of their volunteer efforts, CIBA members have become a vital force in the community. In the summer of 1990, CIBA was contacted to provide expertise for police officers on bikes. Two CIBA members, Ric Ritter and Tony Furdock, met with Indianapolis Police Department Officer Roger Tuchek and by the next year, there were nine mountain bikes purchased and used for patrol. The year before, 1989, BAP (Bicycle Action Project) was started by CIBA member, Charles Hammond. BAP was an experimental educational program aimed at serving at-risk youth and unemployed adults through activities related to cycling. After BAP closed in 2004, another CIBA member, Nancy Stimson, picked up the dream of helping kids to earn a bike through working and learning, and in 2007 founded Freewheelin' Community Bikes. Freewheelin' has followed BAP's lead in focusing on teaching bike mechanics, lifeskills and safe riding techniques to urban youth. While BAP also worked to provide jobs to unemployed adults, Freewheelin' has focused almost entirely on youth, leading "Explore Indy" family fun rides twice a week during the "season"." CIBA's largest and best-known event is the Hilly Hundred held every fall. 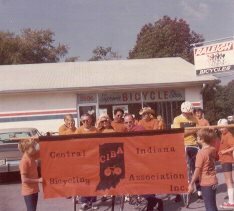 This event originally began in 1968 by Hartley Alley, who led the Southern Indiana Bicycling Touring Association, SIBTA. People came from Chicago, Louisville, Columbus, and Cincinnati with a total of sixty riders. In 1971, CIBA and SIBTA co-sponsored the event with Charlie Sanford as the General Chairman. CIBA officially took over the event with Charlie as chair until 1975 when Charlie retired. Ross Faris took over the ride at that point, and he built the ride into the 5,000 rider event that it is today. A more detailed history of the Hilly Hundred is included as a separate chapter. A second CIBA classic was born in 1994; Navigate Indy This Evening, otherwise known as the N.I.T.E. Ride. This is a unique, exciting ride and party that allows participants to ride 20 miles through the heart of Indianapolis at night. CIBA is involved with charitable causes through the CIBA Foundation. The purpose of the Foundation is to promote bicycling-related charitable and educational projects. CIBA has grown considerably since the early days to one of the largest bicycling clubs in the country and continues to be a strong force in both touring and bicycle safety. Members donate time to talk to school children about bicycle safety. There is a wide spectrum of cyclists within the organization. Some of CIBA's members have ridden in RAAM, BAM, (Bike Across Missouri), Paris-Brest-Paris, and many other long distance races. Some members rarely ride, but join to support cycling. All members have one thing in common--love of cycling. Involvement in CIBA is through ride leadership, committees, and other volunteer work for the club. CIBA's board consists of nine members with the president, vice president, secretary, and treasurer elected yearly. The nine member board rotates with three members elected each year. Committee chairmen are appointed by the president. The board members, officers, and chairmen, which make up the Executive Committee, meet periodically to conduct CIBA business, including approval of the annual budget, the ride schedule and reviewing reports from each committee chair. Committees, such as the Ride, Newsletter, Hilly Hundred, and N.I.T.E. Ride meet at the discretion of each respective chairperson and as often as necessary to complete their task. All executive meetings are open to the membership if they wish to attend. The annual meeting is held in January and a dinner is held in the fall at which time elections are held.